One of the comforting benefits of roadsign collecting used to be that —because of roadsigns are country specific— you can't get lost once you know your signs. Some short hints from the team fieldguide. But this kind — which is a member of the so called U.K group of signs— is found in Iran, South Africa, Iceland and many other countries. We find them on many places in the northern hemisphere and also well south of the equator. 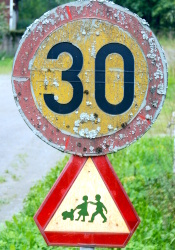 The widespread use makes this type of roadsigns close to useless as a localisation tool. Globalisation hits us again. 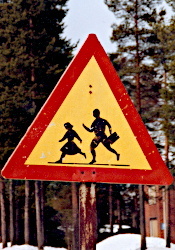 This sign —found in front of Jeesiönranta junior high school - Jeesiönrannan yläaste — is very different. 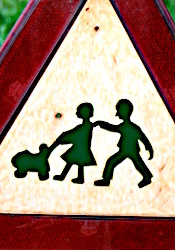 The children do not hold hands. They are running, not walking. The boy is tallest and carries a bookbag. We have more or less similar signs from e.g. Iran, The Netherlands and Italy but none is exactly the same. Two countries, however, do display matching roadsigns: Switzerland and Syria. It is located in front of the Vuotso elementary school. 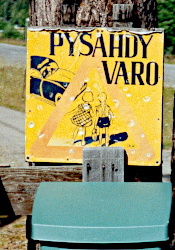 The sign includes words PYSÄHDY (stop) and VARO (look out). Also a small inscription TALJA can be read. Talja was a traffic security oriented organization until the 1980's. The sign probably dates from the 1960's. This roadsign is interesting in several aspects. 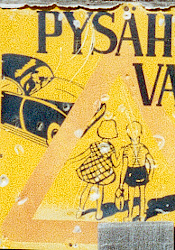 + First we have the amazing detail in the drawing: the car with driver, the clothing, the shadows. Compare this with the equally detailed Katmandu children. This find here is better however. + Then see how the children walk away from us. Normally they walk in the plane of the sign. Other countries were we have found this feature are e.g. The Gambia and (less obvious) Ireland. + The girl keeps the boy from stepping on the road. She puts her hand on his shoulder. This is typical behaviour for children of the UK-group. + The general approach is very peculiar. 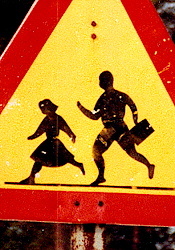 Usually signs are designed from the car's viewpoint. They warn for objects or people that could be in the way. 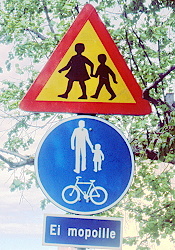 This sign shows the dangerous situation: the possible victims and the target of the message. A similar approach was seen in Ireland. If memory serves right, this find is one of a kind: a very nice drawing of a boy guiding a girl and the girl pushing a perambulator. We have no reports of similar signs in any other country. We have other finds where children are shown playing, but then the toy of choice —if there is one shown— is always a ball (e.g. Great Britain, Trinidad & Tobago). On some rare occasion the ball comes with another toy: a hoop like in Costa Rica or a jump rope like in Bulgaria.